How can farmers manage their fields to reduce the level of greenhouse gas (GHG) emissions? What role does time of year play in the rise and fall of emissions? Do common crops, such as blueberries and potatoes, emit more GHGs compared to forage fields? A team of LFS researchers, led by Professor Andrew Black, is tackling these questions in B.C.’s first long-term study measuring GHG emissions from agricultural crops year-round. The project has received $1.8 million in funding over five years from Agriculture and Agri- Foods Canada (AAFC). The project will benefit Canada by moving it away from Tier 1 (default) or Tier 2 (country-defined) emission factors towards Tier 3 (modelled and measurement-based) emission factors in reporting climate impacts from agriculture to the Intergovernmental Panel on Climate Change (IPCC). Other researchers include Associate Professor Maja Krzic, Assistant Professor Sean Smukler and Research Associate Rachhpal Jassal. The team is capturing year-round GHG emissions of nitrous oxide (N20), methane (CH4) and carbon dioxide (CO2) using the eddy covariance and flux chamber techniques at farms in the Fraser Valley, as well as at UBC Farm. Once the team quantifies the emissions of current farm management practices in B.C., it hopes to work with Canadian producers, policy makers and the scientific community to help reduce climate impacts. Some actions taken may be using fertilizer more efficiently, and developing mitigation technologies for blueberry, potato, and forage crops in the Lower Fraser Valley. So far, early results are in from a Westham Island blueberry farm. 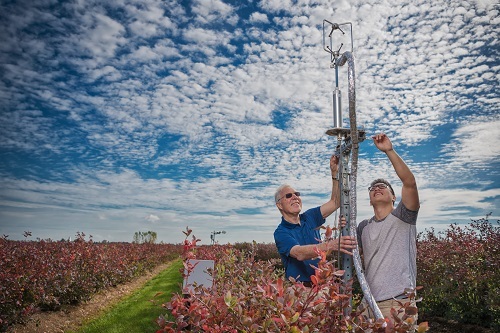 Black and his graduate student Patrick Pow (pictured above) used an eddy covariance system to capture GHG fluxes every 30 minutes. This automated system was developed together with LFS Research Engineer Zoran Nesic. The blueberry field was a very weak carbon sink with net CO2 uptake during summer months and losses in winter months. Methane emissions were inconsequential, which, with its global warming potential of 28 times higher than CO2, was equivalent to one fifth of the magnitude of the CO2 uptake. The field was a moderate source of N2O emissions, which has a global warming potential 298 times higher than CO2. Nitrous oxide emissions continued throughout the year, increasing sharply after application of nitrogen fertilizer and following rain events. The net GHG budget (accounting for all three GHGs) of the blueberry field amounts to emissions of 0.38 t CO2 equivalent ha-1 which was dominated by N2O emissions. Other measurements currently underway are at a potato field, also on Westham Island, and almost a dozen other blueberry and potato fields using manual chamber measurements to study the effects of fertilization, irrigation and drainage treatments. Studies led by Krzic and Smukler measure changes in soil carbon stocks and soil GHG fluxes. Partners in this project – which runs from 2017-2021 – include BC Ministry of Agriculture, Pacific Agri- Food Research Centre at Agassiz, Delta Farmland and Wildlife Trust and Delta Farmers’ Institute. Globally, the agricultural sector is the second largest emitter of GHGs. In 2017, the sector emitted approximately 11% of global GHG emissions, equal to about 6 billion t of CO2 equivalent, according to the World Resources Institute. This is second only to the energy sector.